The AFM, considered to be "similar to polio" due to its detrimental effect on the nervous system, has increased since 2014, reaching a peak in the fall and disconcerting researchers. AFM typically develops after an enterovirus (think: respiratory problems, fever), more often in children. But while most children leave the other side perfectly well, some begin to exhibit weakened muscles and reflexes approximately three to ten days after the cold-like symptoms subside. AFM can also cause facial loosening and drooping eyelids, as well as difficulty speaking, swallowing and even breathing. The AFM may come from the poliovirus, but the researchers have eliminated that suspect: when analyzing the cerebrospinal fluid of 440 patients since 2014, they found evidence of pathogens (none of them related to polio) in only four samples. The CDC still do not know what causes this disease, but of the more than 400 cases identified so far, more than 90 percent have occurred in children. In addition to the 116 confirmed diagnoses, 170 possible AFM cases are currently under investigation. The AFM has tended to proliferate between August and October of each year, correlating with the start of the cold and flu season, and increasing every two years since 2014 (2014, 2016 and this year). 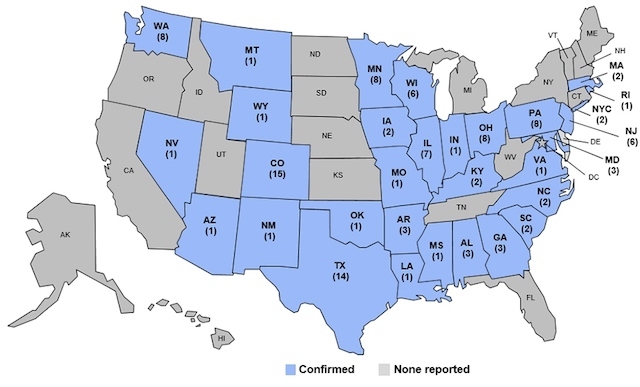 Neither New York nor New Jersey are among the states with the highest number of AFM diagnoses (Colorado and Texas lead the pack, with 15 and 14 cases documented respectively), but the CDC urges parents and guardians of children who present symptoms to inform a doctor as soon as possible: The agency requests help from medical professionals to gather information for their investigation. He has also convened a working group to get to the bottom of this mysterious disease, and as CDC Director Robert Redfield, MD, put it in a statement, "to actively detect, treat more effectively and, ultimately, prevent the AFM and its consequences ".